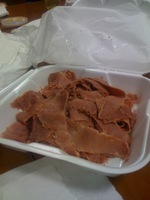 Bridget Callahan blogs about many interesting things and recently snapped a picture of left-over Corned Beef in some walk-in refrigerator on East 4th Street (presumably) where her boyfriend works. Given that we're in the aftermath of St. Patrick's Day, the scene makes sense. I encourage you to read her post; she makes some astute observations about what East 4th Street (one of my favorite lunch and coffee locations) has become. Our combined bill came to $140.70 and $109.25 of that was all beef, glorious beef! We had Corned Beef sandwiches, Pastrami sandwiches, take-home boxes of Corned Beef, sides of various kinds and (of course) deli pickles. It was an all-out Corned Beef fest. 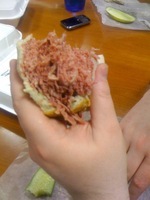 The Corned Beef idea was gaining some traction at the office and there were several folks who wanted to make the pilgrimage to Slyman's to prove, once and for all, that they have the best Corned Beef in Cleveland. The original plan was for the group to trek out there, grab a table and sit down to sample and enjoy, but once the full invitation list was fully counted, we concluded that a group that large would be quite unwieldy and that we should do take-out instead. Oh, did I mention that this was a Friday during Lent? Fridays during Lent may be a great time to visit a Corned Beef restaurant famous for its Corned Beef and also its long lines. Then again, for some people, it may not be. For us, it worked though, since the drivers were able to get there, pick everything up and drive on back in a very short amount of time. 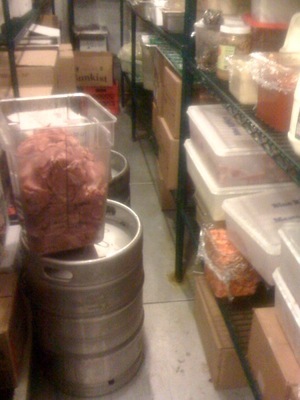 My job was to get us some place to eat all this Corned Beef goodness. Some of the less-pretentious and more-functional conference rooms were booked so I called in a favor and got the Situation Room with its fancy table and chairs. And truthfully, we needed it since a total of ten folks showed up for lunch. 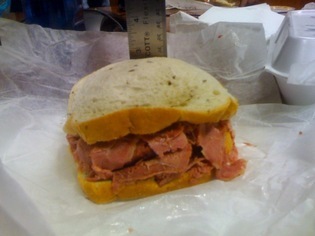 And that, I'm beginning to understand, is how Corned Beef should be enjoyed.